Cenotes are my first unexpected favorite of the trip. 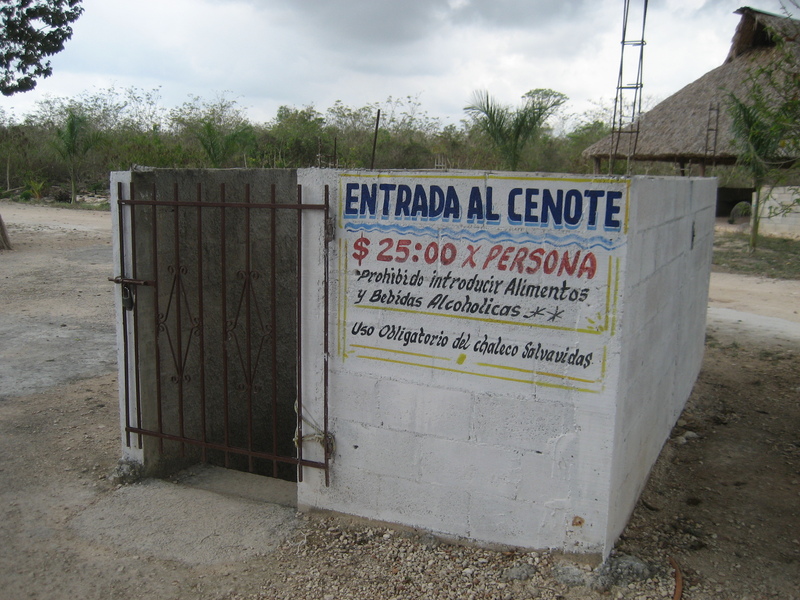 Everyone at the hostels talked about them–“make sure you swim in a cenote!”–so of course I was going to, but didn’t know quite what to expect. 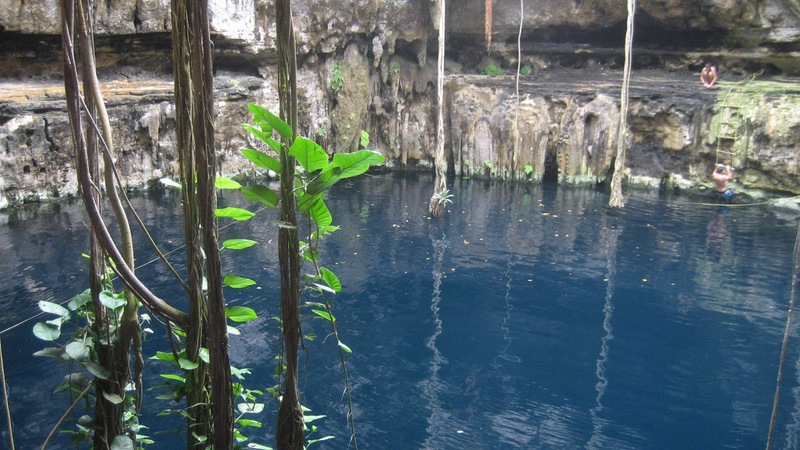 For those unfamiliar, cenotes are giant sink holes characteristic of the Yucatan that expose reservoirs of fresh ground water and make for excellent swimming holes. The ancient Mayans used them as natural wells, sometimes considering them sacred and using them in religious rites. I joined up with a friendly Canadian brother-sister duo who were just finishing a one-month sibling trip after not seeing each other for two years. They were lovely company and made me feel like part of the family. In fact, I got mistaken for their sister multiple times! It made me wish my sisters were out here with me–another time surely. We rented three junky old beach cruiser bikes from the hostel and headed out of town. A blissfully overcast day, we broke away from the city streets quickly. No suburbs to speak of, just tall grasses and scattered trash along the 3km road south. San Lorenzo from above, 100ft drop to the water. After my swim, looking across to John and Anna on the far side. 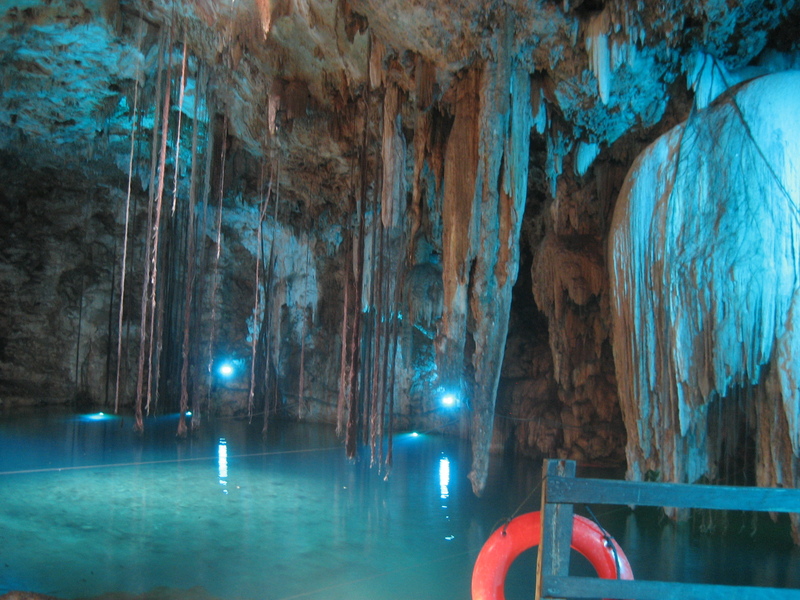 First, we visited cenote San Lorenzo. Newly discovered only a couple of years ago, next from a brand spanking new hacienda was a big hole in the ground 300ft deep (2/3 filled with water) that turned out to be a ton of fun. We plunged into the cenote in style via the rope swing. John and Anna led the way, with me in last and barely managing to stay untangled of the rope on my descent. The water was cool and beautiful. We may have had the cenote all to ourselves, but we weren’t alone. Miniature catfish dotted the water, a carrion bird nested under the top edge, and tiny bats flitted above as we swam behind the coverage of stalagmites on the far side. Luckily no creature from the depths (I pictured the giant space slug the Millennium Falcon accidentally hides in… “This is no cave!”) decided to join us! Riding en route to our second cenote, Xkeken, the warm rain smattered my face and I felt happy to be there at that moment. 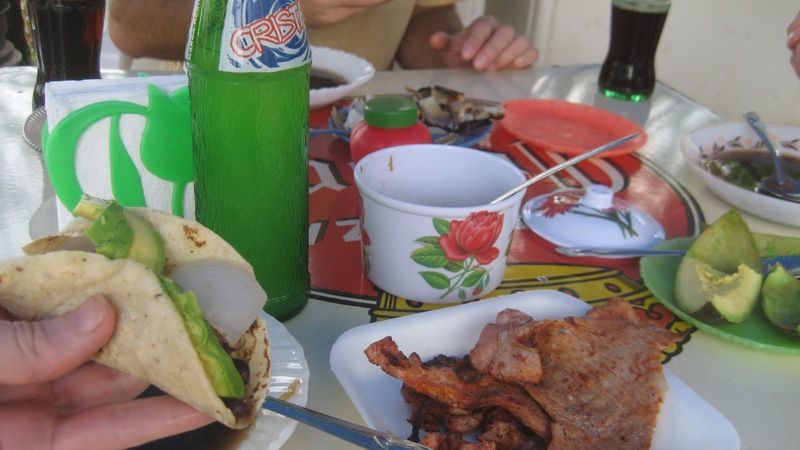 We ate a delicious carne asada taco lunch with all the fixins on the side of the road, befriending the family who ran the restaurant and learning about a unique white-headed fish inside from our young waiter. Xkeken was completely different; I wasn’t expecting them to have such different personalities. Xkeken was an enclosed cavern with cool, shallow water and lit with rotating purple, red, and pink lights. We plunged into the fresh clear water, tracked down the white-headed fish, and enjoyed basking in the other-worldliness of it all. Good advice anytime. Down we go. 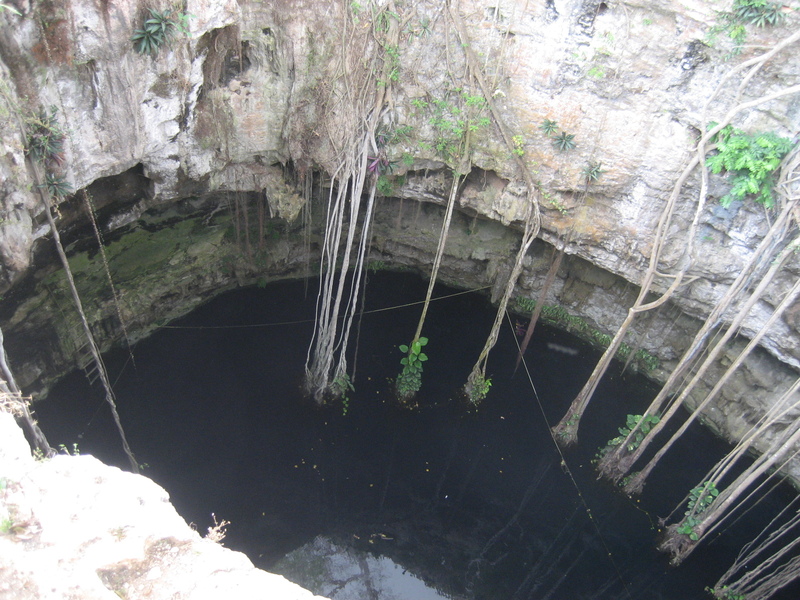 The Yucatan is peppered with cenotes, so I know many more are in my future. I hear especially gushing reviews about those near Tulum. Can’t wait to get my snorkel gear and go! 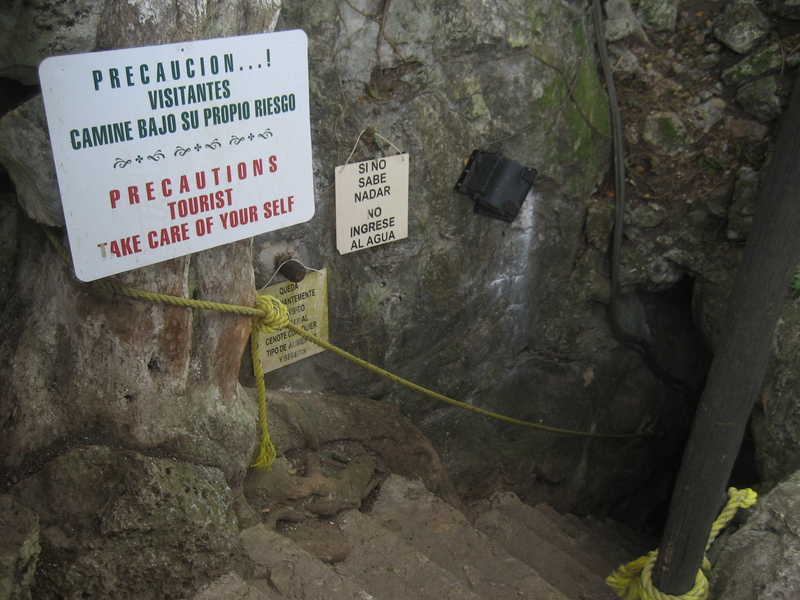 This entry was posted in Adventure, Central America, Mexico by ladyasatramp. Bookmark the permalink. Wow! Thats so great that you had it all to yourselves. I've got to say I am a LOT jelous! Awesome! Especially the video made me feel like I was there with you! Thank you, E.
What a lovely article. Thanks!